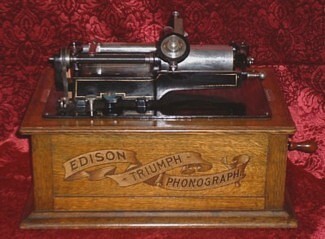 The Edison Triumph phonograph came in several configurations during its rather long lifetime. The first ones came with a rather small 14" horn while later ones came with a large morning glory horn or cygnet horn. Flowers were often painted on morning glory horns and cygnet horns came in metal or wood. The price ranged from $50-$75.